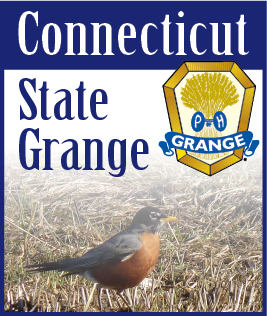 The 128th annual Connecticut State Grange Session is behind us, the delegate body worked long hours and diligently completing all work with 45 minutes to spare; great job done by all. There were a few key votes taken that will positively affect us as a Grange. First, the delegate body instructed me to set up a Fundraising Committee to develop ways of generating non-dues related income. If anyone is interested in serving on this committee please contact me. I will make an announcement of the full committee in January. We are planning on holding a raffle to be drawn in late February early March. This will be our first major fundraiser. Second, the Delegate body authorized the hiring of a “scout” to be contracted to go into selected area in the state and set the ground work for new Granges to be organized. It will be this persons “job” to work closely with myself and Jeff Barnes with the primary and only function of organizing new Granges. Once there is enough to organize the Grange the Grange Growth Team will step in close the deal. That means we more Grangers trained in the Grange Growth Process. Are you interested? I hope to have enough interest so we can have one Trained Grange Growth Team in each Pomona. Sister Jodi Ann and I will soon be on our way to Boise, ID for the National Grange Session and look forward to the honor of representing you. We hope everyone has a healthy and safe Thanksgiving.